Have you ever been inside of Amazon's Seattle Sphere's? When I was there last year parts were under construction so I didn’t visit, but now I’m kinda of regretting it. However, this portion: Willmott's Ghost restaurant and bar, designed by Price Erickson - was not yet open. I absolutely love how elegant this restaurant looks. Don’t you just want to cozy up in those wrap around booths? 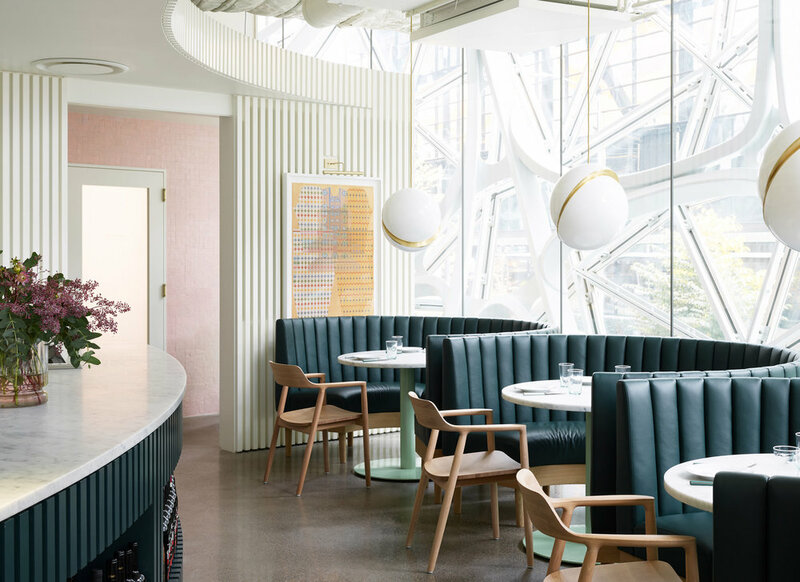 Now I need to go back to Seattle just to eat in this lovely space! Scroll down to see how you can get a similar look for your breakfast nook or dining space in your home! Design by Price Erickson, Architecture by Heliotrope Architects. You can see more images and read more about the project in this article by Dezeen. In this week’s installment, I’m showing you how you can get this great minimalist kitchen. I found this image on Pinterest, and it’s one of those that don’t link back to the article about the image - so unfortunately I don’t know the designer or any other information about it. If you do - please let me know! Thanks for coming back. I’m thrilled that you are enjoying this new series: #GimmeThatDesign. If you are new around here this is meant to be fun and educational. In this series, I will use an image of a beautiful space that I love and I will source furniture and materials to give you that design for yourself. 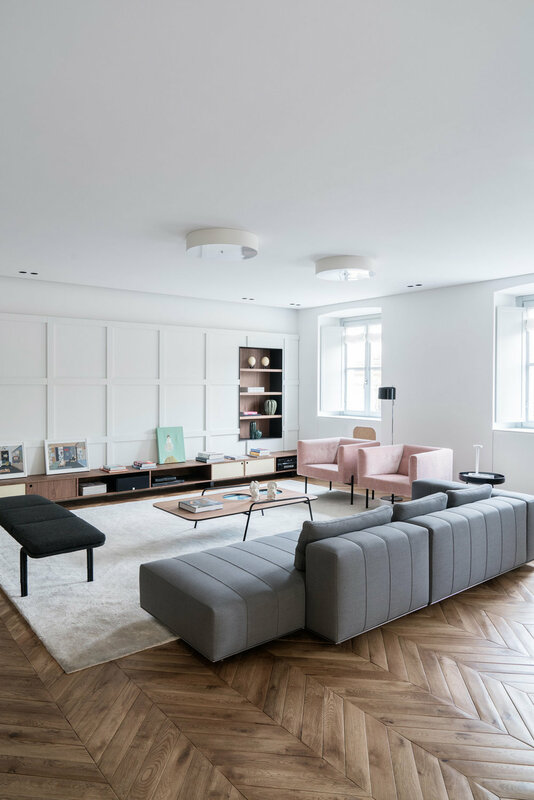 Today’s installment features this beautiful vignette of Hotel Odeon in Copenhagen designed by Co.Designstudio in collaboration with textile designer Barbara Bendix Becker as seen in this article on Design Milk. Welcome to the first of a new series. #GimmeThatDesign is meant to be fun and educational. In this series, I will use an image of a beautiful space that I love and I will source furniture and materials to give you that design for yourself. 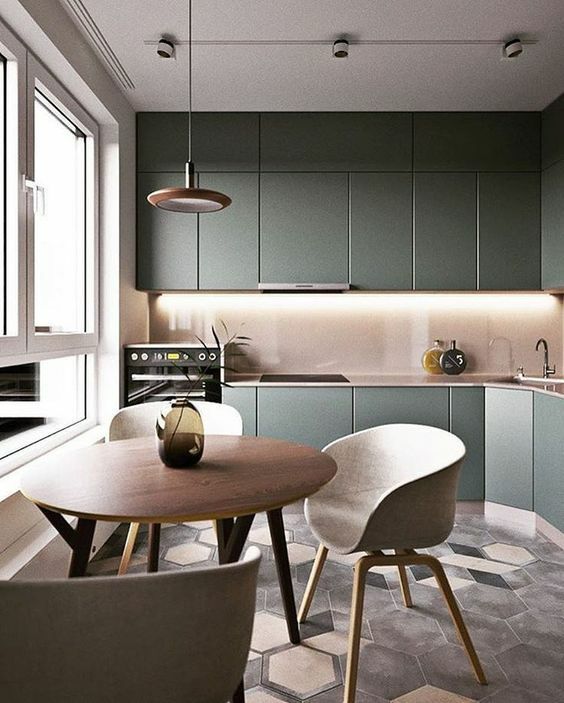 Get the look from Fabrio Fantolin designed apartments in Turin, Italy as featured in this article on Dezeen.